Our Bert and May fabric book hangs with some lovely woolies on our vintage hooks! 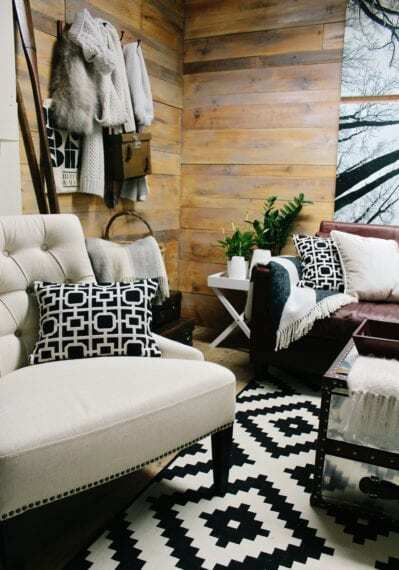 It was so lovely to get back into the Homestagers Design Studio, and I got to see the fabulous wooden cladded walls that Collette has installed for the first time. It was love at first sight! They are absolutely beautiful, and bring such warmth to the studio space. This month we decided to go for a Nordic, monochrome feel, along with warmer shades of chestnut and brown in the form of leather. 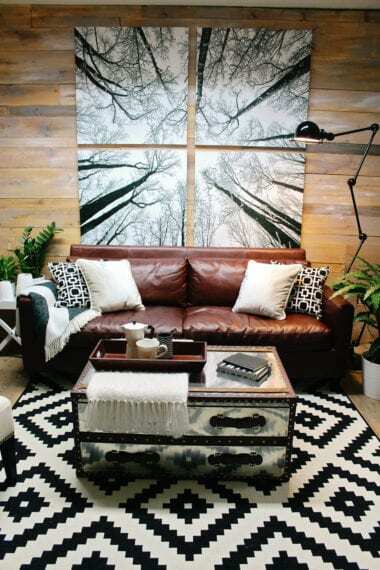 We pulled these warmer shades in by using vintage leather suitcases, and this amazing chestnut leather sofa, which all sat beautifully against the wood. We gathered graphic black and white cushions and throws and layered them up on the sofa and this simple linen occasional chair. Mix these graphic prints in with plain textiles in wool and linen for a cosy yet striking look. 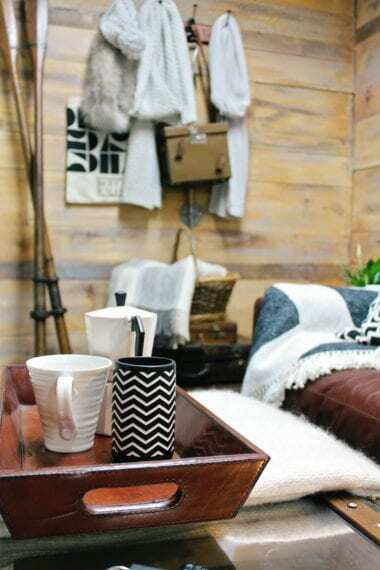 We made a cosy vignette by hanging chunky knit scarves on rustic pegs, along with a vintage leather camera case. Stunning antique wooden oars make a strong visual display, and it’s always worth looking our for larger pieces such as these at antique fairs and auctions to decorate your home with. Lastly we added a flash of lush greenery to really lift the room set and bring a little of the outside in. The botanical trend is a really easy way to keep your interiors looking fresh, plus the colour Greenery is the Pantone colour of the year, so this is the perfect way to bring a little of that into your home!